Facebook pages feature is used by number of Facebook users for promoting specific brand, celebrity, website, blog or online journal. Till now, you could only post real time updates on Facebook page. 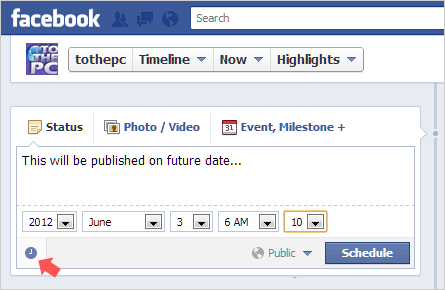 Now using new scheduling feature for Facebook pages, you can draft post updates and schedule them to publish automatically on selected future date. You can schedule a post up to 6 months in advance in 15-minute intervals. 1. After Facebook login, click to open your Fanpage from listing on left sidebar. Then click to type post message that you want to schedule for automatic publishing on past or future date under Status tab. 2. Then click on small clock icon at bottom left part of update box. Then select future: year, month, day, hour and minute when specific post should be published automatically. 3. 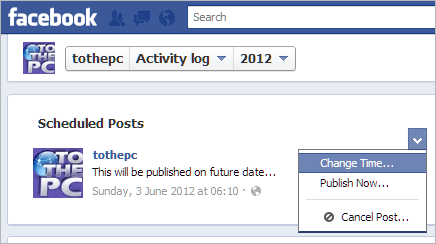 Then click on Schedule button to queue that post for automatic posting on future date as selected by you. You can also use this feature to fill your timeline with posts on older dates. Just select date in the past and post will appear to corresponding date on your timeline. Your current selected time zone settings will be used to schedule post on past or future date. You can schedule multiple posts and all can be viewed by clicking Activity Log button. All schedules updates are displayed on the Activity Log page. You can easily edit time and date of any scheduled post. There is also option to post scheduled update immediately or cancel that update. For sure this is a handy addition for automatic posting of updates on future or past dates – no need to rely on third party tools and apps for such functionality on your Facebook page. Take a look at Future Scheduler app for iPhone, Android and Blackberry this will not only help you in scheduling text messages but also emails, status update and phone calls.